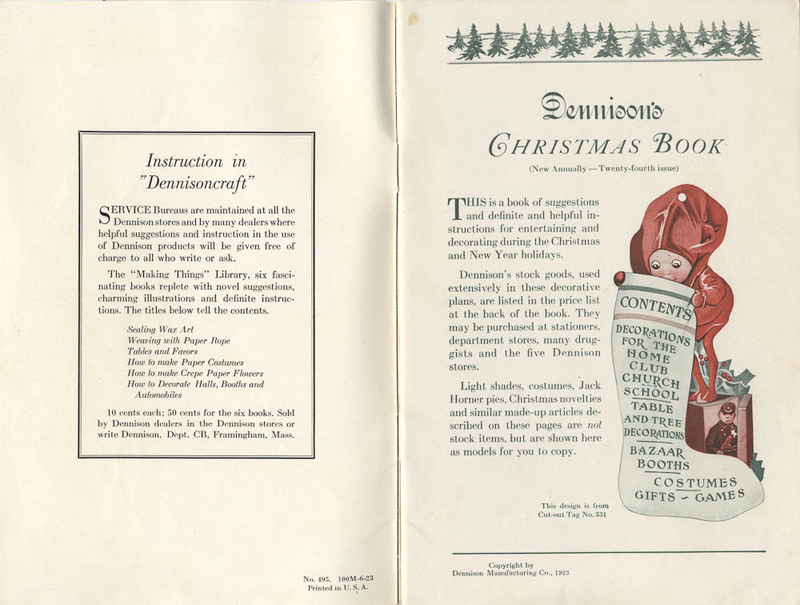 One of these catalogs is Dennison’s Christmas Book from 1923. Most of the catalog focuses on decorations but there is one page with ideas for homemade gifts made from crepe paper rope and sealing wax. Framingham, MA, Dennison Mfg. 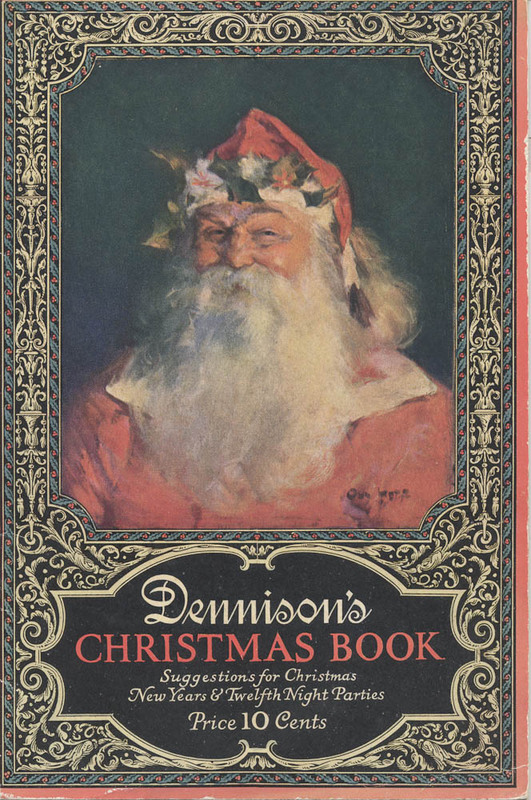 Co. Dennison’s Christmas Book, 1923, front cover, Santa. Framingham, MA, Dennison Mfg. Co. Dennison’s Christmas Book, 1923, inside front cover and title page. One suggestion is to take material which typically used “as a finish in decoration” and use it to make a gift instead. That material is crepe paper rope. As the catalog explains, “Weaving with crepe paper rope over wires is a pleasant and easy pastime and the articles produced are practical as well as beautiful.” Some of the gifts made with this material include baskets and trays, as shown below. Later on in the catalog, there is also a page with general directions for working with crepe paper. Framingham, MA, Dennison Mfg. 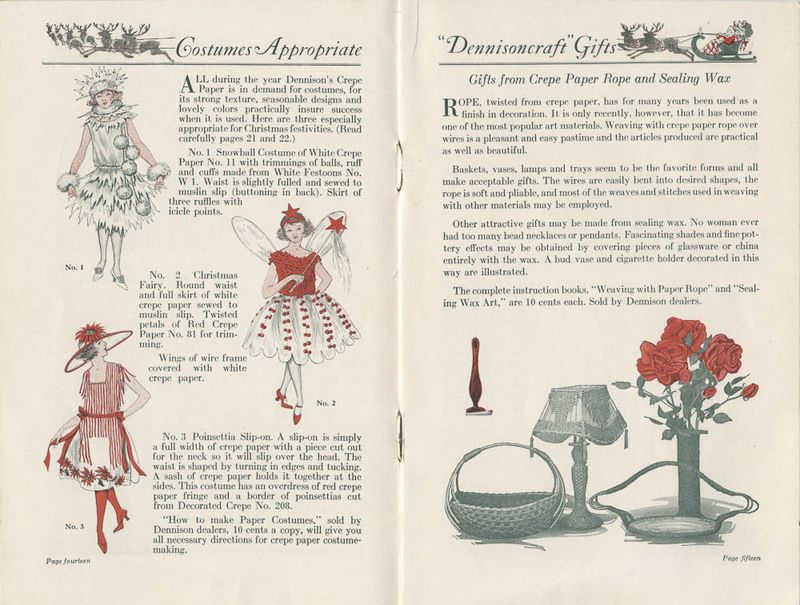 Co. Dennison’s Christmas Book, 1923, pages 14-15, page 14 shows holiday costumes and page 15 shows homemade presents. This catalog also gives many ideas for decorating with crepe paper. One idea is to make a wreath out of crepe paper, see illustration below. The base is made of a round cardboard ring reinforced with wire. It is padded and wound with green crepe paper and then strips of overlapping green crepe paper in petal shapes are glued onto the circle. The berries are made from red crepe paper. Framingham, MA, Dennison Mfg. 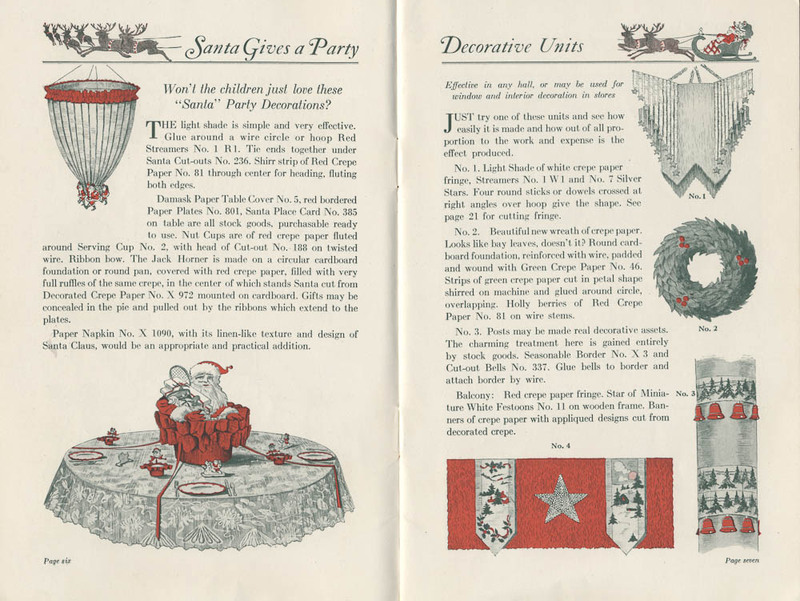 Co. Dennison’s Christmas Book, 1923, pages 6-7, crepe paper decorations. Dennison’s Christmas Book and other catalogs by Dennison Mfg. Co. are located in the Trade Literature Collection at the National Museum of American History Library. Interested in more images of homemade decorations? Take a look at Galaxy of Images for more pages from this catalog or check out previous posts about homemade holiday decorations and holiday costumes. Thanks for sharing all the ideas. These are some great ideas for homemade party decorations handmade gifts. This will be a great help for people for Christmas party decoration.